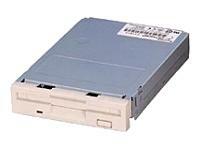 Panasonic - Disk drive - Floppy Disk ( 1.44 MB ) - Floppy - internal - 3.5"
Panasonic's vision of the digital future is driven by the needs and aspirations of its business customers and millions of consumers around the world who use its products every day. Panasonic shares their dream to live a fuller life by providing ways of working smarter and enjoying the rewards of technological advances. Media Type Floppy Disk - 3.5"